The people were so excited to hear Paul preach, he preached all day! 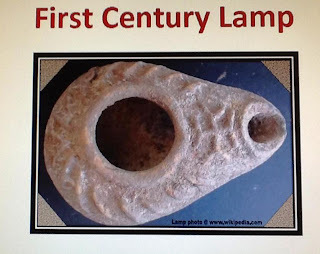 The lamps were lit and Eutychus fell asleep and fell out of the window. Review: Last week we studied about a silversmith from Ephesus called Demetrius. He made a lot of money making silver idols called Diana. He heard about Paul preaching about idols made from hands were not the real God to worship. He called other silversmiths together to warn them and try to stop Paul. There was a crowd shouting and most of them didn’t even know what was going on! A city clerk finally quieted the people down and told Demetrius to go to court if he thought Paul was a problem. Lesson: Today's lesson is found in Acts 20:7-12. Read Acts 20:7 Paul and some other Christians sailed to Troas. They were there 7 days, and on the first day of the week…which is? ?…Sunday, the Christians gathered together to worship and break bread, just as Jesus commanded them to. Here’s another example of why we worship and have communion EVERY first day, which is Sunday, of the week. Not just when we feel like it, or on special days. The Bible says the first day of the week. Paul was planning to leave the next day, so he preached all day… until midnight!! Another part of worship that Jesus told us to do, on the first day of the week, is preaching. The people had a lot of lamps lit. They were together in an upper room. There was a young man named Eutychus. He started to fall asleep, a deep sleep! Eutychus fell asleep and while Paul kept preaching, he fell out of the window! He fell from the 3rd floor and died. The people went back to the upper room and ate and talked until the sun rose. Then Paul left and the people were thankful that Paul had brought Eutychus back to life. They were thankful that they had gotten to spend time listening to Paul preach. Let's talk a little bit about worship, and why we are even here. First of all, God told us to worship Him on the first day of the week. We know that is Sunday. We worship in the church building. The people are the church. He didn't tell us how long to worship, but He did tell us how He wants us to do it. There are 5 specific parts of worship He commanded. We are going to have a lesson about worship, so we will just talk about the basics that God wants. Paul wrote about worship in his letters, and we are going to study about some of Paul's letters when we are finished with this study of Acts. Click here to print the worship booklet. Romans 16:16 ASV The churches of Christ greet you. NKJV The Churches of Christ salute you. salute: to pay respect to or show honor, possibly by raising the right hand to the side of headgear A church building can't greet or salute anyone, so the people are the church. 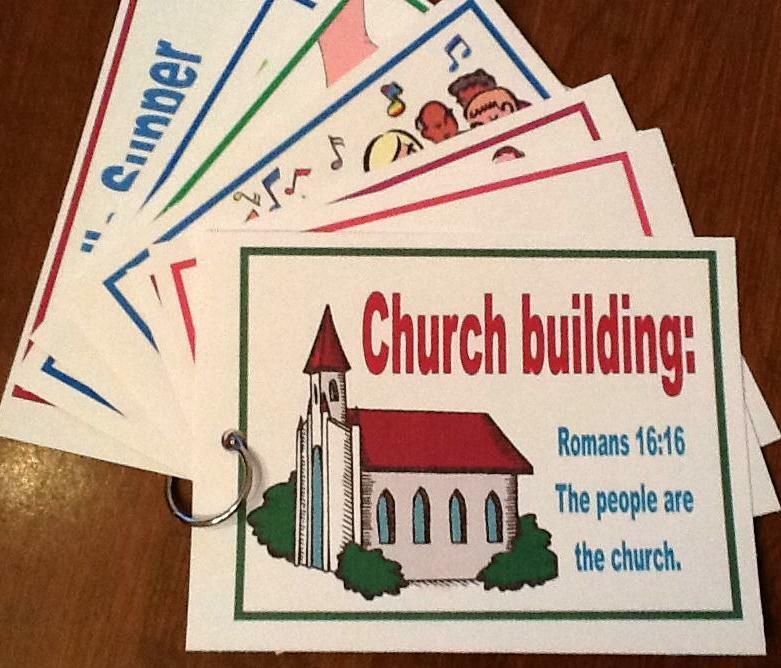 Can a church building say Hey, (Hi, or Hello), how are you? That is how we greet someone, or shake their hand or give a hug. Can a church building do that? No, of course not, so the people are the church, the church building is a ... church building. I used Acts 20:7 for several, just because they go with our Bible lesson today. You can print the worship booklet here. The early Christians worshipped God with the same rules that we have. But, when all the disciples of Jesus that had the power to perform miracles died, then miraculous works died too. God doesn't give people the ability to perform miracles, like Paul brought Eutychus back to life. They were given the power to show people that didn't believe in Jesus, what He could do through them. I wanted a super simple worksheet for the students to review what we discussed about worship. So, this download has the hand you see and a blank page with a title for them to draw their hand and fill in the answers. Click here to download. Click here to print the Eutychus worksheet. I was asked about miracles in a comment below and thought I would add some scripture here to answer it. We once sent out a letter to different religions asking about their beliefs for an adult Bible study. A couple letters that were filled out and returned were answered with apparent anger. I don't know why. Anyway, we received about 25 answer sheets back and only one, ONE, had scripture to back up their answers. Every single answer. That staggered me. And, yes, it was from a Church of Christ. Anyway, for any biblical questions, the answer should be searched for in the Bible. That is all that matters. What does God want or say about it? Hello Freda, the 1 O'Clock time has been added, it is the last link after the watches. Thanks for the request and the idea! You're welcome! Glad you can use them! Thank you so much for your ideas. I love the watches! What a clever way to teach the story of Eutychus! 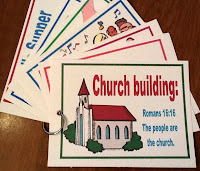 I am going to use it with my preschool class on Wednesday night. Thanks Linda! Glad you can use it! Thanks for the comment! Thank you for stopping by! Exodus being the Old Law, the people were required to worship Him on the Sabbath, being Saturday. They also were not permitted to do anything on the Sabbath. Under the Old Law, they were were required to sacrifice animals, too. They were restricted to the meat they could eat: Clean vs. Unclean. These are a couple of the rules that changed when Jesus died on the cross. If you look at any days of assembly in the New Testament after Jesus died, under the New Law, people worshipped on the first day of the week. That is Sunday. In every account in the book of Acts, Luke tells us that they gathered together to worship on the first day of the week. Even our memory verse today: Bible Verse: Now on the first day of the week, when the disciples came together to break bread, Paul, ready to depart the next day, spoke to them and continued his message until midnight. Acts 20:7. THank you for these great plans and ideas! I teach everyweek and appreciate the thought that you've put to these scriptures. This looks like a fun lesson, but I don't understand where you find this in the Bible "...when all the disciples of Jesus that had the power to perform miracles died, then miraculous works died too...."
I have seen and personally experienced miracles of healing. Are you saying that NO miracles happen anymore (since the 1st Century AD)? I have added some links above for you to look at that have scriptures with the topic. My simplest answer for my students is Jesus gave the power of miracles to His disciples and they could give it to some people. But, those people could not pass it on. They have all since died. So, there isn't anyone alive with the ability to do miracles like Jesus did. Acts 8:14-18 Thanks for stopping by! James 5:14-16 Is anyone among you sick? Let him call for the elders of the church, and let them pray over him, anointing him with oil in the name of the Lord. And the prayer of faith will save the one who is sick, and the Lord will raise him up. And if he has committed sins, he will be forgiven. *There are many other scriptures that tell us that miracles still happen today. I respectfully want to bring this to your attention. You are blessed with a gift ...it is very obvious. My eyes were drawn to that line in sadness. Miracles still happen today (2018). The miracles are from God (He is risen). You shared scripture about the Holy Spirit but then made a definitive statement that is confusing more than one person. We are telling you we have seen miracles happen. Jesus died but then rose again. Matthew 28:6 6He is not here; he has risen, just as he said. Come and see the place where he lay. Hello, Kristi, we use the word miracle different today than the Bible does. For instance, people will say “It’s a miracle they survived!” “Babies are miracles!” Yes, I fully believe in the power of prayer. I truly believe God hears and answers our prayers. If you look at the miracles in the Bible, they were done to show proof of Who God is and His power. Instantly. For instance, Eutychus and Dorcas. They had died and they were given life back due to a miracle. Instant power from God. My mom died while in intensive care. They brought her back to life with heart massage and medical treatment. That is not a miracle. Big difference between then and now. Yes, I fully believe God allowed her to be alive again and it was God’s will. It was amazing and a blessing. But not a miracle. My dad was also cured of cancer. I know lots of people that have been cured of cancer. But, they went to the doctor and did the treatments the doctor suggested for them. It wasn’t instant cancer-free because of belief and prayer. Yes, we prayed for my dad. A lot. Yes, we had faith he could be healed. But, he had to take the medical steps to be cured. vs. 13 I am sure you know people that have been sick, or were in an accident, or many other things. People prayed and prayed, but they died anyway. Just because so many are praying for a certain condition to happen, doesn’t mean that is what God wants and will make our wants happen because that is what we are praying for. The key to this scripture is vs. 16: ‘Confess your trespasses’. Confess your sins. Tell the elders about your sins and pray for each other. It doesn’t say physical sickness. It is spiritual sickness. Pray and you will be healed. Spiritually. Forgiven. Praying together will give you strength to fight the sin so you can be spiritually healed. As for John 14:12-14, I am going to ask you to read a reply @ https://tinyurl.com/y9t27dj8 because it is a much better worded answer than I can give you. I have also seen unexplainable things happen. But, that is not the same as a miracle. For more scriptures, please see the end of the post above. I thought my students would enjoy this lesson as we study worship. Thank you for sharing this! It has some great thoughts and ideas! Hi, I would love to use the watch printable but I cant find the one where the face is on a different page than the watchband. I just have to tell you how much of a blessing you are to our small congregation. We are just a small church with no full-time staff, but a group of people that thoroughly love the Lord and His Word. The materials you share take such a long time to put together and you do it with such care, ensuring it is consistent with the Word of God, it saves us precious time that we can spend praying for the lesson, the kids and studying scriptures. I thank the Lord that He has bestowed on you such a wonderful gift and that He has given you a heart to share with others.